Jog, eat, drink, repeat. Discover the vibrant culture and pop history of Track Town, U.S.A. Welcome to Eugene, OR. From live mermaid shows and runaway ducks to parties with JFK, Graduate Providence has a wild history. Hit the pavement and explore PVD on foot to discover the city's best hidden gems. Our hotel walls were their canvas, and the people of PVD did not disappoint. We learned firsthand why they call Providence "the Creative Capital" at our kick-off event. Rock band White Mystery crashed with us at Graduate Iowa City earlier this month. We asked them for some hard-earned travel tips from their 10+ years on the road. 2019 is shaping up to be a busy year for Graduate Hotels — just take a look at our Coming Soon list. We’re set to plant our flag in 10 new college towns over the next 12 months. We told you a bit about Graduate Eugene and Graduate Annapolis back in August, and now we have a preview of three more Graduate hotels to share with you. Here’s a look at what’s in store for Graduate Providence, Graduate Fayetteville and Graduate Columbus. We love reimagining a historic hotel. Graduate Seattle and Graduate Berkeley are both great examples of that. 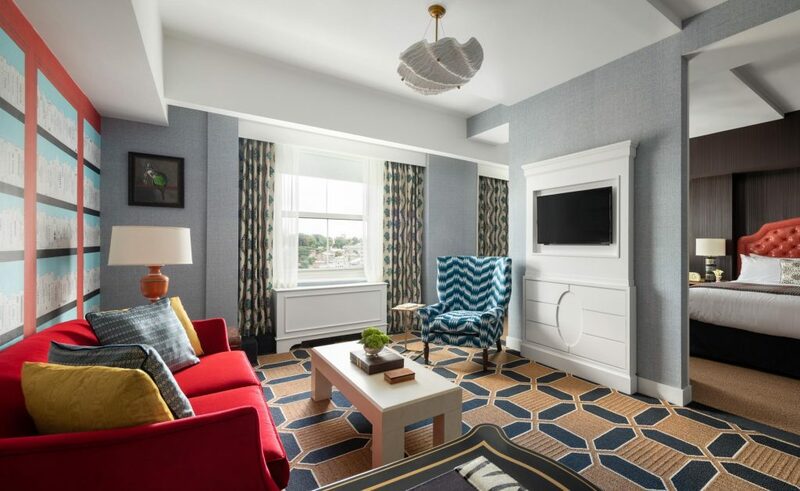 To update the iconic Biltmore Hotel in Providence, Rhode Island, our design team pumped up the color palette and added some Graduate humor for good measure. The parakeet painting in the living space is a tribute to the Farrelly brothers, who were born and raised in Rhode Island. You may have heard of their little film Dumb and Dumber. Clearly, we have. Other inspiration comes from nearby Brown University and the Rhode Island School of Design. College-era photos of famed alums, from actress Laura Linney to musician David Byrne, grace the guestroom walls. The hotel officially opens as Graduate Providence at the end of March. Stay tuned for details about opening events and celebrations. 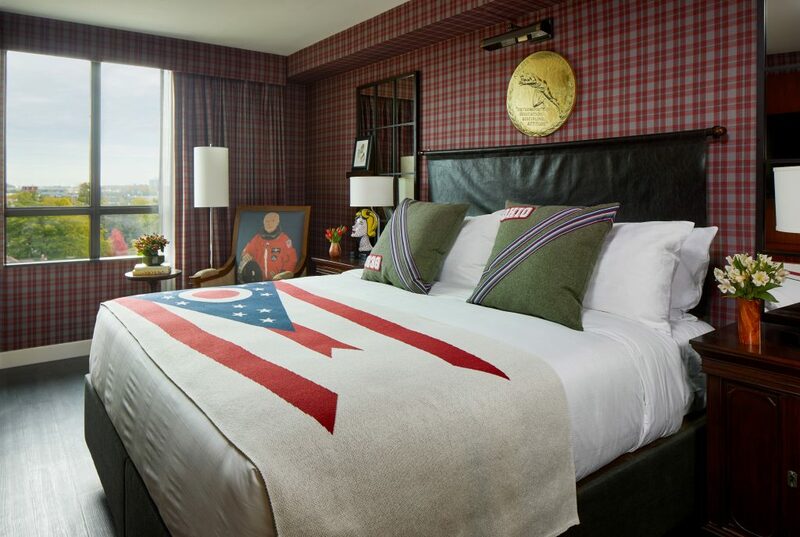 With wallpaper and curtains in scarlet and gray plaid, there’s no mistaking this guestroom is geared toward fans of The Ohio State University. Graduate Columbus celebrates OSU notables, including Olympian Jesse Owens and astronaut John Glenn. You’ll also spot a nod to everyone’s favorite spooky series, Goosebumps. Yep, author R.L. Stine is a Buckeye, too. Time to start working on our Hog Call. Graduate Hotels is heading into Razorback territory. 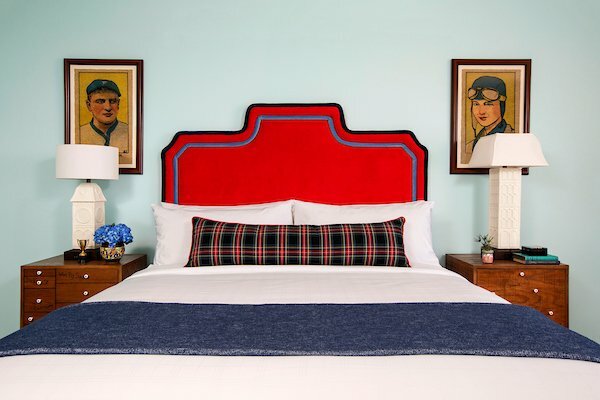 University of Arkansas alums will quickly spot the familiar outline of campus mainstay Old Main in the headboard design. Throughout Graduate Fayetteville, splashy, abstract patterns and bold prints (hello, camouflage carpet) celebrate the town’s artistic core. The hotel is right off Fayetteville’s historic Downtown Square and just a few blocks from action-packed Dickson Street. 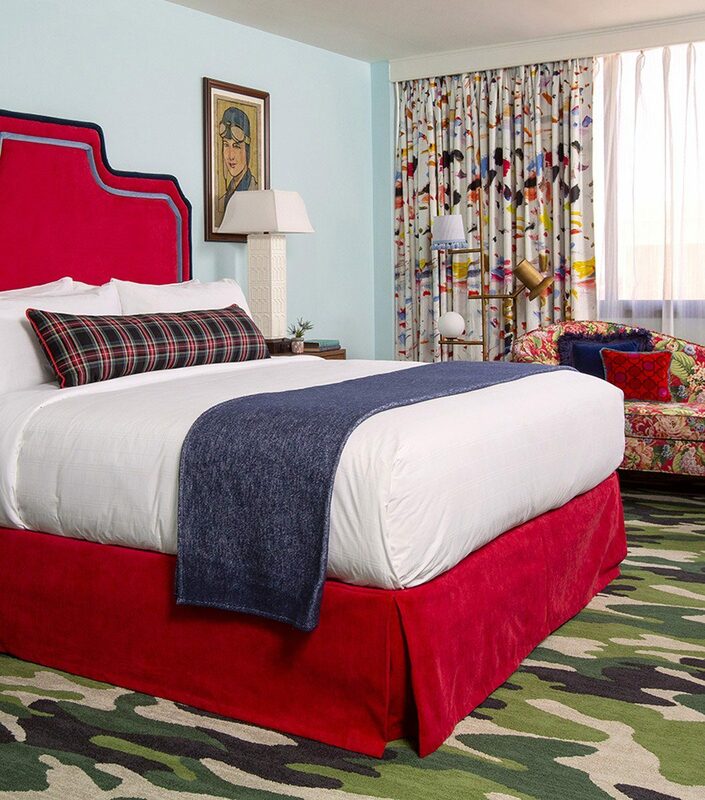 Want more sneak peeks of our latest boutique hotels? Follow Graduate Hotels on Instagram and Facebook.